For a long time, manufacturers have provided computers with growing amounts of memory integrated into tinier devices. However, semiconductor companies are unable to minimize the size of memory components as rapidly as they used to, and in addition to this, present-day designs are also not energy-efficient. Traditional memory devices employ transistors and depend on electric fields for storing and reading out information. An alternative method that employs magnetic fields to store information is now being explored. 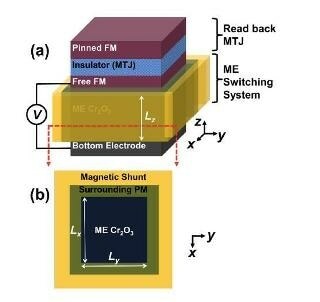 There is one potential version of magnetic device that depends on the magnetoelectric effect. This effect enables an electric field to switch the device’s magnetic properties. However, existing devices may need large electric and magnetic fields that are not easy to create and contain. A novel switching element made from chromia (Cr2O3) presents a possible solution to this problem. This switching element could one day be used in flash drives and computer memory devices. "The device has better potential for scaling, so it could be made smaller, and would use less energy once it's suitably refined," said Randall Victora, the paper’s author and a researcher at the University of Minnesota. The scientists have reported their findings in Applied Physics Letters, from AIP Publishing. Switching elements are used in computer memory. These devices are very tiny and are capable of switching on and off to store bits of information as zeros and ones. Earlier, researchers found that the magnetoelectric properties of chromia allow it to be "switched" with just an electric field, but to enable this switching a static magnetic field has to be present. Now, building on these elements, Rizvi Ahmed and Victora have developed a novel design for a memory device with a heart of chromia that eliminates the need for any externally applied magnetic field to function. In their design, the chromia is surrounded with magnetic material, providing an effective magnetic field via quantum mechanical coupling to Cr magnetic moments and at the same time enabling the devices to be arranged in such a way that nearby devices are not affected by stray magnetic fields. On top of the device, an element to read out the device’s state - to establish if it's in zero or one state - is placed. This arrangement could possibly pack more amounts of memory into a smaller space since the interface between the magnet and the chromia is the key to the coupling that causes the device to operate. As the device reduces in size, the greater surface area of the interface in relation to its volume enhances the operation. This property is advantageous over traditional semiconductors, where greater charge leakage and heat loss occur due to increased surface area caused by the device’s shrinking size. Ahmed and Victora are now planning to team up with colleagues who work with chromia to develop and test the device. If the new device is successfully developed, it could possibly substitute dynamic random access memory used in computers. "DRAM is a huge market. It provides the fast memory inside the computer, but the problem is that it leaks a lot of charge, which makes it very energy-inefficient," said Victora. In additions, DRAM is volatile, which means information disappears as soon as the power source is interrupted, for instance, an unsaved document is erased during a computer crash. This device, as illustrated in the paper, would be nonvolatile. On the other hand, it may possibly take years to perfect such a memory device. One major obstacle is the heat tolerance of the device. Plenty of heat is generated by computers, and modeling predicts that the device would cease functioning around 30 °C, which is the equivalent of a hot summer day. To improve the device’s function, the chromia could possibly be optimized by doping it with other elements and thus make the device more appropriate to replace current memory devices.